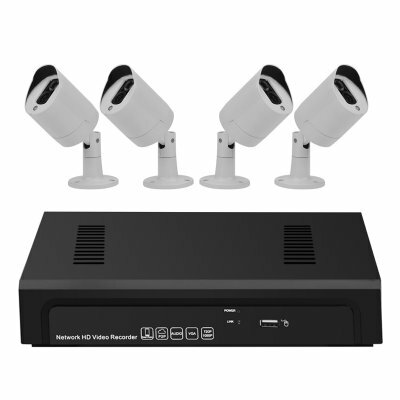 Successfully Added 4 Channel 1080P NVR Kit “Sentinel Pro” - 4X 1080P PoE Cameras, Motion Detection, Alarm Notification, Remote Viewing to your Shopping Cart. This standalone 4 Channel full HD 1080p NVR Kit brings a comprehensive security solution. It features fantastic video output, easy installation, mobile surveillance support and up to 4TB of storage support. Security is one area where you certainly don't want to cut corners, this premium quality system is easy to install and will reward you with high definition video, motion detection, alarm notification as well as mobile surveillance, which will let you view the cameras any time right from your Smartphone or tablet (Using Goolink App ), brining you ultimate peace of mind. The Sentinel Pro’s 4 indoor security cameras offer 1080p recording and are perfect for indoor use, the metal housing ensures they are suitably protected against vandalism and tampering while a IR LED array offers up to 20 meters of night vision support so you have HD surveillance both night and day. With 1/2.8 inch CMOS sensors the cameras have 1920x1080 resolutions and a 600degree viewing angle that can be recorded at 30fps so you won’t miss any details. Set up alarm notification through the motion detection feature and you can have snapshot notifications sent to you email or commence recording when the restricted areas are entered. H.264 video compression allows recorded video to be compressed to a fraction of the size so as you can make the most of your storage space and the NVR’s SATA port lets you add a HDD with up to 4TB or storage for plenty of video archiving. With Power over Internet (PoE), its quick and easy to install the cameras as they only require a single Ethernet cable to power them, this reduces the need for additional power adapters and removes the necessity of placing your cameras near power sockets or extensive cabling work. This 4 camera NVR kit with its clean and simple setup brings you the freedom to mount the cameras wherever you wish and makes the system more versatile. This “Sentinel Pro” 4 Channel NVR Kit comes with a 12 months warranty, brought to you by the leader in electronic devices as well as wholesale security systems. Basic Protocol: RTSP/ FTP/ PPPOE/ DHCP/ DDNS/ NTP/ UPnP etc.